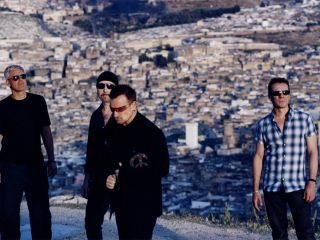 U2's No Line On The Horizon hit the top of the charts on both sides of the Atlantic in its debut week, giving the Irish band their 7th Number 1 in the US and their 10th consecutive Number 1 in the UK. The new disc moved over 484,000 copies in the States, according to Nielsen SoundScan. This represents the biggest sales week for an artist since Britney Spears dropped Circus in early December (that CD sold 505,000 in its opening seven-day stretch). In the US, U2 last hit Number 1 with 2004's How To Dismantle An Atomic Bomb, which sold an impressive 840,000 in its first week. This disparity in sales could have something to do with the fact that the album leaked a week before its release - caused by a gaffe by Universal's Australian arm, no less. Or it might be attributed to the steady erosion in CD purchases overall. According to SoundScan, since the peak year of 2000, US CD sales have dropped 54.6 percent. In the UK, U2 also bowed at Number 1. Although opening-week figures are unavailable, it is said that their first-day sales of 64,698 were the biggest of their kind in 2009. However, the band's lead-off track from No Line On The Horizon, Get On Your Boots, fell short of cracking the UK Top 10 - the first time U2 has failed to do so with a debut song since New Year's Day in 1983. This raises another question: Do U2 fans, an increasingly older audience, actually purchase singles anymore? Hard to say, though we suspect that might not be the case. And even though some industry observers believe the album should have performed better, it seems as though U2 are still faring well during difficult economic times.